Volunteers enable nonprofit organizations to reach more clients and more effectively fulfill their missions. However, the good done by these volunteers may be offset by their careless behavior. Rising fears that resulting lawsuits and monetary damages would deter potential volunteers from volunteering caused Congress to enact the Volunteer Protection Act. This research studies court decisions to ascertain whether the law fulfills its purpose and considers the implications of these interpretations for nonprofit managers. It also tests the usefulness of the hermeneutical approach to legal interpretation and to determine how the Act has changed as a result of these court decisions. 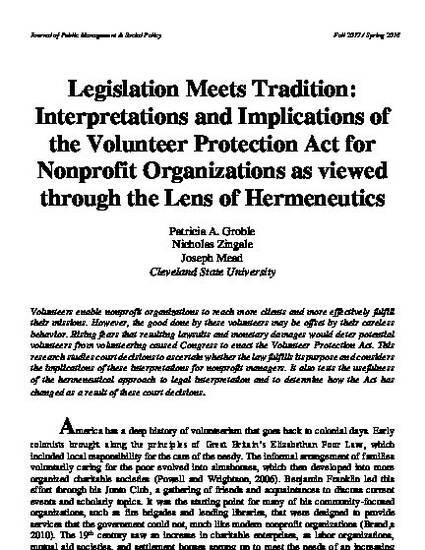 Groble, Patricia; Zingale, Nicholas C.; and Mead, Joseph (2018) "Legislation Meets Tradition: Interpretations and Implications of the Volunteer Protection Act for Nonprofit Organizations as viewed through the Lens of Hermeneutics," Journal of Public Management & Social Policy: Vol. 24 : No. 2 , Article 3.